There is a common saying: ‘A picture is worth thousand words!’ Then, in this case, what about the worth of cameras that freeze the moments for us forever. They must cost hundreds of bucks. Well, let us burst the bubble for you as now you can easily get Personalized Action Cameras from C2BPRomos in just a few dollars. Just imagine the kind of impact such Promotional Action Cameras would have on your employees and clients. It is always beneficial to use such giveaways that one can use in daily life. These Custom Action Cameras aren’t like the other advertising giveaways or merchandise that be thrown away or easily forgotten, which means brand retention for longer time. This is a gift that will keep on giving back! Everyone is into action cameras now a day; this is the newest trend in the market capturing every moment possible. Everyone loves it as everyone loves to share. We now have Facebook, Twitter, YouTube, etc. where people can post their exceptional experiences as no other camera phone can capture high speed movement except for Promotional Action Cameras. There are now a lot of casual users to professional users. There is a big chunk of market niche in this industry and it has also been a primary gadget for extreme sports thus the demand has always been consistently rising. It’s a great opportunity to invest in this promotional material as most of the big companies are doing so. Providing the latest technologies to your customers surely does create brand crusaders which in fact is one of the benefits of engaging into promotional materials. But of course, one would want to create a long lasting impression to their customers. The Promotional Action Camera is now considered as one of the best investment to put your personalized logo because this is the newest trend in the technology product line for promotional product industry. It’s always a cool thing to have your logo on a Personalized Action Camera for the reason that it is widely placed onto skateboards, bikes, helmets, surfboards and a lot more. People are born with natural curiosity and therefore, the first thing that they would look into is a new gadget and from that gadget is your personalized logo. Everywhere the user will go; your company’s logo will always be there for others to see. Then again, these Branded Action Camera with logo are used professionally and casually therefore it is taken to every major event there is; practically you’re advertising to those events for free. C2BPromo.com has always been ahead in securing the needs of our clients for promotional products. 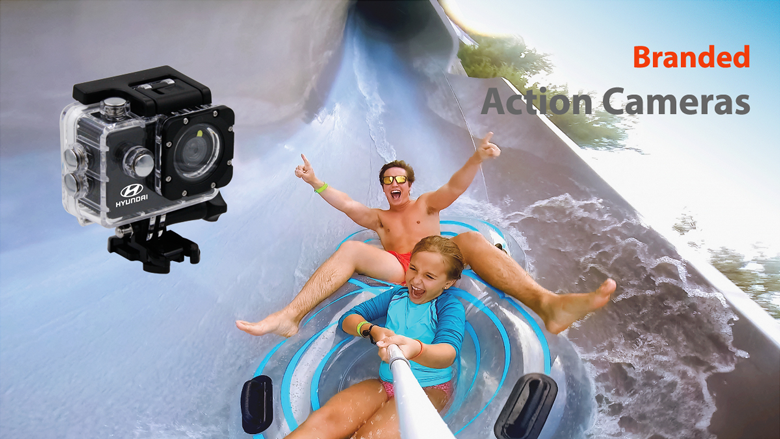 We have placed in high quality Custom Action Camera at a factory price so that businesses can take advantage of this new trend in the promotional product industry. We placed in affordable but durable HD720P, 1080P, Ultra HD 4K to 360 Panoramic Logoed Action Camera into our product lines for you to choose from. We always want to make sure that we get you covered all the leading promotional products and not to be left behind. So don’t wait anymore get a piece of that market pie and be the visionary company you are supposed to be.